Mindfulness: A Journal provides the user with a series of simple journaling prompts designed to nurture a positive, calming framework to approach the day. Each of the writing prompts provides the user with space to examine one's self and ponder some of the basic tenets of mindfulness. 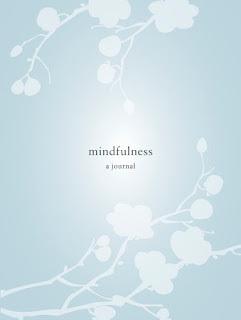 The journal can be completed at whatever pace the user prefers to work at (daily, weekly, etc) and features inspirational quotes sprinkled throughout, as well as introductory material on the practice of mindfulness and a list of resources for further reading. This book claims to have a totable, giftable package. I thought that literally meant that it was wrapped in a creative box or package that would be enticing as a gift. I guess all it means is that the journal is in a book form making it easy to give as a gift- not really sure. I wanted to like this book. Really, I did. Journaling was a happy past time of my youth and I was hoping this book would inspire that habit once again. This book was leaned too much on the New Age side for my liking. Quotes included in this book such as "stop, breathe and be," quotes on meditation and the concept of purifying the mind was too much for me. As a Christian, this book does not jive with me. Others might enjoy it, but not me. Disclaimer: This book was provided by Blogging For Books. All opinions stated are my own.